Huge Savings Item! Save 15% on the Coghlan's Camp Grill by Coghlan's at Mystic Oaks. MPN: C8775. Hurry! Limited time offer. Offer valid only while supplies last. 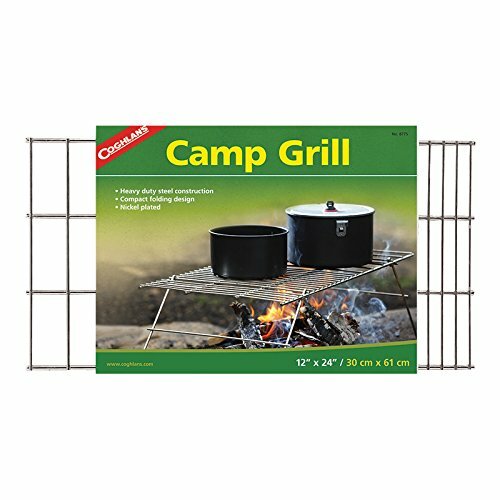 Outfit your camp kitchen with this Camp Grill from Coghlan's, which allows you to easily create a grill surface for pots and pans over a campfire. Outfit your camp kitchen with this Camp Grill from Coghlan's, which allows you to easily create a grill surface for pots and pans over a campfire. Constructed of heavy-duty 100-percent nickel-plated steel, it folds flat for easy storage or packing. Its grill surface measures 24 x 12 inches and it stands approximately 7 inches tall. Coghlan's makes the outdoors more comfortable and enjoyable with over 450 accessories for camping, hiking, fishing, and RVing -- from cooking gear to first aid kits, insect netting, firestarters, tent repair, and more. View More In Barbecue Tools.